How is the rest of the 40-man roster playing? Elizabethton lost a wild Game 2 of the Appalachian League Semifinals, but the E-Twins can still advance to the finals if they win Sunday evening. Chris Williams was the offensive star of the night, though Luke Raley also had an excellent game, while Carlos Suniaga and Edwar Colina delivered the strongest pitching performances. Come check out what else happened around the minor league system Saturday night. 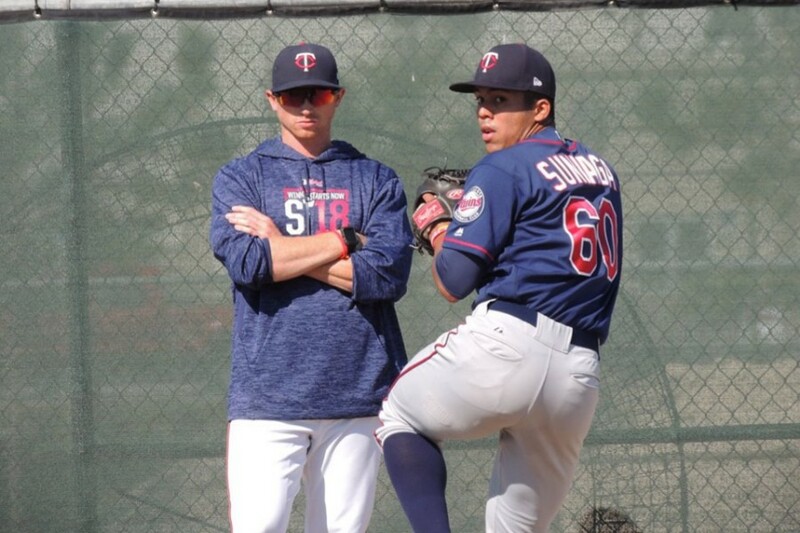 -Tyler Duffey, Johnny Field and Andrew Vasquez were all called up to the Twins. Zack Littell is also expected to get called up for Sunday’s game. -Omar Bencomo and Dietrich Enns were both promoted up from Chattanooga to Rochester. -Bryan Sammons was activated from the DL and assigned to Chattanooga. He made his Double-A debut tonight. Fernando Romero struggled to find the strike zone and the Red Wings’ lineup couldn’t get much going. Romero walked five batters in his three innings of work, throwing 38 of his 73 pitches for strikes in the process (52.1 percent). Rochester’s only run was scored in the first inning. Nick Gordon hit a two-out triple and scored on a Kennys Vargas single. D.J. Baxendale pitched a scoreless inning before Dietrich Enns held the IronPigs scoreless over the final five frames. Byron Buxton did not play. This was Bryan Sammons’ Double-A debut, and he got beat around a little bit (see above), though the six strikeouts are encouraging. Luke Raley, who will be representing the Twins in the Arizona Fall League this year, was a home run shy of the cycle and Brian Navarreto had a three-hit night as well. Andy Wilkins continued to provide power for the Lookouts. He hit his 12th home run in what’s been just 130 plate appearances for Chattanooga. Brent Rooker, who will also be participating in the AFL, was 1-for-3 with a pair of walks. The Miracle took a 2-0 lead, but the Threshers tied it up on a two-run homer in the sixth, then scored three runs in the top of the 10th inning. It was a rough night for the Fort Myers lineup, as Nos. 1 and 2 hitters Royce Lewis and Alex Kirilloff combined to go 1-for-10 with a pair of strikeouts and the team combined to go 0-for-5 with runners in scoring position. Edwar Colina had a great night, striking out nine batters over 6 2/3 innings. Ryan Mason followed with 2 1/3 innings of scoreless ball before Hector Lujan gave up the runs in the 10th. This loss dropped Fort Myers to a game behind the Charlotte Stone Crabs in the Florida State League South standings. The Miracle play their final regular season game tomorrow. The Kernels did most of their damage tonight in the third inning. Ariel Montesino led things off with a walk, stole second base and advanced to third on a ground out. Michael Helman was hit by a pitch to put runners at the corners. That Montesino-Helman combo was able to pull off a double steal, giving the Kernels their first run. Trevor Larnach hit a double that plated another run, and then scored on a Ben Rodriguez double to give Cedar Rapids a three-run inning. This was the first time Carlos Suniaga, who spent much of the early season as a reliever, pitched more than five innings. He went seven innings, remarkably needing just 83 pitches to do so, 61 of which were strikes (73.5 percent). Elizabethton could have punched its ticket to the Appalachian League Finals, but they fell just short in a wild game. Kingsport jumped out to a 3-0 lead before the E-Twins even had the chance to bat. E-Town chipped away with runs in the second and fourth inning. The game-tying run came across thanks to a wild pitch. The catcher’s return throw attempting to get Ricky De La Torre got past the pitcher. Lean Marrero tried to score all the way from second base, but the pitcher retrieved the ball, tossed back to the catcher and caught Marrero to end the inning, leaving the game tied 3-3. And that’s how things would remain through nine innings. I was disappointed to see the new extra innings rule in which a runner starts on second base was carried forward to postseason play, and it certainly made an impact in this one. After combining to score six runs through nine innings, a total of seven runs were scored in the 10th. Kingsport tallied four runs in the top of the 10th, but the E-Twins nearly came back to tie it up again, scoring three runs before recording the first out of the inning. Elizabethton got the tying run all the way to third base, but couldn’t seal the deal. This was such an odd game. The E-Twins managed their six runs on just seven hits (Kingsport had 15), were only credited with four RBIs (the K-Mets committed four errors) and they also racked up 13 strikeouts. Chris Williams was, of course, a beast. In his five plate appearances, he had two doubles and two walks. After taking over for starter Luis Rijo, Kody Funderburk delivered four scoreless innings before running into all that trouble in the 10th. 8. Akil Baddoo (CR): Did not play. 10. Zack Littell (MIN): Promoted to Twins. So is John Curtiss not getting called up? And what about Reed and Anderson? One problem with calling up Reed and Anderson is that they are not on the 40-man roster.Yes, most of us see several players on the current roster who could be released.The problem with adding some of these, however, if you don't plan to have them on the 40-man next spring they have to go thru waivers as opposed to just hanging on to them until they are minor league free agents (they are Rule 5 eligible).I recall us losing a few relievers in past years because of this. What a rotten time for the Miracle to go on a two game losing streak.Now they need to win today and HOPE that Charlotte loses.I cannot tell you how much I hate this bloody minor league extra innings rule.No way of knowing how that run effected last night's ETon game? Has anyone else noticed the influx of Venezuelan players the last few years?I believe the Kernels have six on their roster, almost a quarter of the team.And I recall the GCL Twins and DSL Twins were both loaded with kids from there.Wonder if this has been by design, or just chance?And if intended, why?Maybe Seth or some of the guys could ask one of their contracts about this. One problem with calling up Reed and Anderson is that they are not on the 40-man roster. Yes, most of us see several players on the current roster who could be released. The problem with adding some of these, however, if you don't plan to have them on the 40-man next spring they have to go thru waivers as opposed to just hanging on to them until they are minor league free agents (they are Rule 5 eligible). I recall us losing a few relievers in past years because of this. I agree with you, up until the last sentence. While we and every other team has definitely lost relievers on waivers, I don't think we have lost one in spring that we just added to the 40-man the previous September. But yeah, adding Reed and Anderson at this point is all about how many roster spots you need this winter. If they don't, and give innings to Belisle, I'll lose my mind.The 40-man issues with Reed and Anderson I can understand, but I can't understand not getting every available arm up here, and giving more innings to those who are not part of the future. Although I too would like to see as many of these young arms as possible, Romero's last couple starts indicate he is outta gas.Probably best to shut him down and go home to rest. The Miracle won behind Graterol.Charlotte is losing by a run in the top of the 9th.Can Florida hold on?If they do, the Miracle and Charlotte will end the season tied for 1st and a playoff spot. @Twins' No. 1 minor league prospect Royce Lewis joins us from Fort Myers! I'd also include La Maquina in that rest period. He's looked completely gassed since August began.